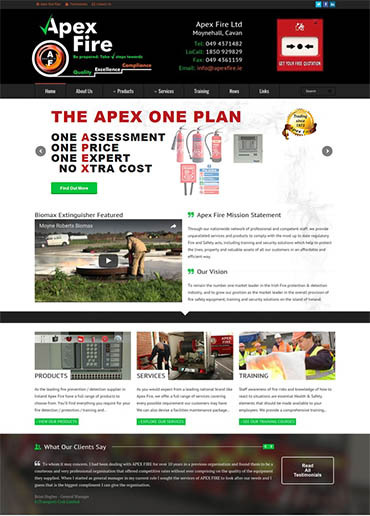 Apex Fire is Ireland’s leading company in the field of fire safety, prevention, and training. From headquarters in County Cavan, they maintain a network of technicians in all 32 counties, responsible for installing, commissioning and servicing fire protection and detection equipment in a wide range of commercial and industrial settings. We had built them an extensive corporate website back in 2012, which they were always happy with, and which always served them well. However, as part of a re-branding exercise, they were adopting a new logo and slogan to feature on all company vehicles, clothing, etc. – and so the online presence needed to change too. We studied the new company logo and carefully considered the effect it would have on the website. It was not a simple matter of merely replacing a logo image at the top of each page, as the client was changing from a white background logo to a black background one. This meant there was much to consider regarding the colour scheme of the entire site. We advised on each of the knock-on effects the change would have, and how the result might not be to the taste of everybody. Our client considered this advice, decided they liked the new look, and gave us the go-ahead to proceed. The most obvious change in the re-design is the colour scheme, as the page headers, menu bars, sidebars, and page footers all changed to black, with corresponding changes in the text contained in each. Several other visual changes were also made – for instance, a re-design of the entire home page, to accommodate video content and new sales funnels; the addition of new ‘call to action’ buttons, and an update of various imagery throughout the site. Text content was also updated or added in several places. New pages were created to highlight additional products and services that had become part of the Apex Fire portfolio since the site was first built four years earlier, while existing content on other pages was widely updated to reflect other changes. No major SEO work was required, as our extensive earlier SEO efforts during the original build meant that the site still ranks organically in the top three for each of its main target search terms. A security updates and maintenance package was nevertheless agreed for the months ahead. You can see the results of all the work here. Our clients already had a site that was working well and that they were happy with – but still, it was time for a change, and we were delighted to again be able to give them what they wanted. We take it as a sign of great confidence in us when somebody we’ve already done a good job for comes back to us to request another major job. It means they know we’ll deliver the perfect mix of what they want, and what will work – and we get great pleasure in delivering it for them.